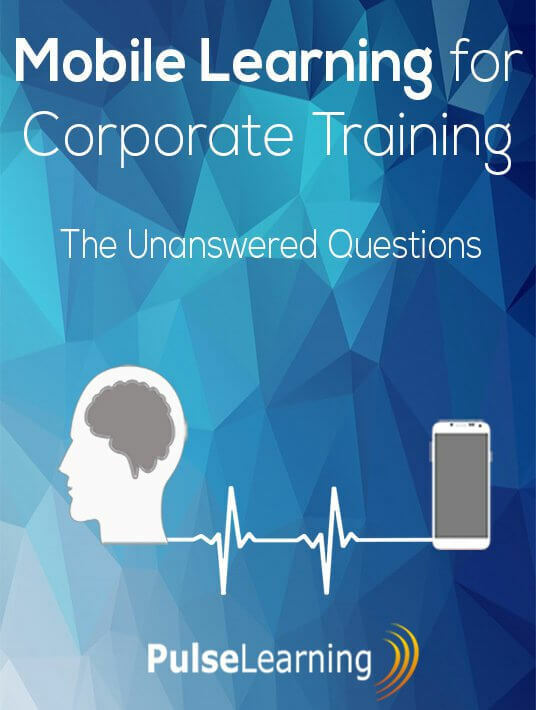 If you are considering Mobile Learning for Corporate Training, then this eBook from PulseLearning is an informative resource to get you moving. Is Mobile Learning Right for Your Corporate Training? Considerations before launching a mobile strategy. Which Organization Are You? What Is Your Corporate Training Mobile Strategy? A few scenarios depicting the appropriate use of Mobile in defining your Corporate Training Strategy. A look at the statistics reflecting use of Mobile in Organizations. Applying these principles will ensure an effective and engaging learning experience. Effective responsive design generates new content depending on the device the eLearning is accessed from. Deciding on the learning type and device configurations is important for your corporate training mobile strategy and creates a convergence between the mobile and business strategy. What’s Next for Mobile Learning in Corporate Training? Where is, this trend going? When everyone is talking about how great Mobile Learning is, let’s talk about how Mobile Learning can make YOU great!